The Ninja, known as the Mystic Shadow Warriors, were the elite fighting force of Ninth Century Feudal Japan. The second instalment of the Last Ninja trilogy transports Armakuni to New York, where he must confront the evil Shogun Kunitoki once more. Your travels are once again displayed in a flip screen isometric format, as you explore the unfamiliar surroundings of Central Park and downtown.. The Ninja, known as the Mystic Shadow Warriors, were the elite fighting force of Ninth Century Feudal Japan. The evil Shogun Kunitoki has once been beaten but has gathered all his mystic powers to create a modern day tyranny in Manhattan. Encounter your arch-enemy Kunitoki within the urban jungle and conquer him with your Ninja style skills. Will this be the final battle? Can you vanquish the evil Kunitoki once and for all? I was a big fan of these two games. In fact, of the Commodore 64 action titles, only Forbidden Forest and Karateka would rank above The Last Ninja titles. 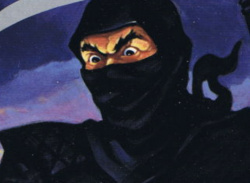 It kinda is weird that they could make the gave so advanced for the C64 and make the ninja in the bottom left blink his eyes. Cooldued59: That'd be the bottom right, surely? Good to see another classic System 3 game out on Virtual Console. Last Ninja 2 is rock solid to play but very rewarding and the graphics and soundtrack are amazing for an 8-bit game. Fingers crossed for Flimbo's Quest, Myth, Tusker and Turbo Charge now! Music for these games is just freakin brilliant!!!! A great game indeed, with fantastic music (I sometimes fire up Sidplay to listen to this game's soundtrack while working). I downloaded the first part. Its much more better playing these great classics with the cube controller. This second Ninja I don`t have to buy, because I own it for my original C64. If part three shows up, I will be Mr. Download again. Ninjas can't swim. That's why pirates will always be cooler than them. @Junichi - Guess you haven't played Ninja Gaiden II then! Ryu can not only swim, but he can walk on water! "Fingers crossed for Flimbo's Quest"
Oh hell yeah. First console game I played in my life (on the C64GS), I need to see this again. If you find the controls on the D-pad a little difficult here's a useful tip: pressing "J" on the virual keyboard will change the control scheme so that you don't have to press on the diagonals anymore, for example pressing up instead of up-right to move in that direction. This makes things a lot easier, especially jump sections. Alternatively you can use the GC controller (the analogic stick of the Classic Controller doesn't work). Your English is far better than my Italian! Thanks for the tip PRP; it's worth trying out if you can't get on with the default controls. It'd be great if someone released a Competition Pro or Zip Stick controller for use on the old 8-bit games! That'd be mint! Is it still possible to miss crucial items for later stages, meaning you would have to restart the whole game? yeah, in the office level there is a code you have to obtain to be able to complete the game. Id recommend writing it down if you get to that bit! Woot! Other Flimbo's Quest fans exist!!! I've never come across anyone who's played it before. It'd be an instant download for me if it ever appears. Flimbo's Quest would be added to my download list too!! 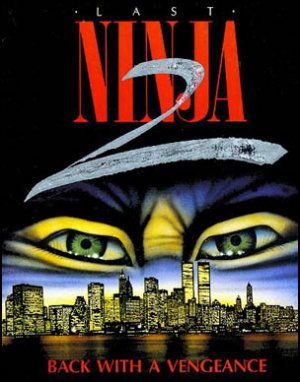 Ninja 2 is every bit as good as the first, if not better and certainly can be more frustrating. Specially as KeeperBvK commented above if you miss some items then you get stck later in the game. Hmm, I'm not interested in C64 games at all, but this game looks kind of interesting. I may give it a shot someday. i remember buying this for the c64 in 1988 for £9.99 from r l gibbons,it was the best game ive ever seen. Are we ever gonna get the C64 in America? I can't wait for this to hit North America!!! All indications are that this series gets better with each sequel. That is rare. You're in luck Turbo. The ESRB recently rated this game E10+ meaning a future Virtual Console release in North America is not far off. Four months later to be exact. Hmm, what could I use these two toilet chains for...? This game was one of the best on the C64, Vendetta was cool too. I had to laugh the first time I noticed superman flying past the office building. Actually, three months later to be exact. bah. you got me. haha. Can u save in the game? Can't say much about the gameplay, but it has some of the best music I've heard in a long time.